Jesus Christ has never looked so ... hairy. An octogenarian woman living in Borja, Spain, was appalled to discover that a 200-year-old fresco of Jesus Christ taken from a 16th century hospice had fallen into disrepair. Being the helpful sort, she took it upon herself to "restore" the painting, despite having little, or indeed no, experience in art restoration. The results speak for itself. What was once a dignified portrait of the Lamb of God, now more closely resembles a crayon sketch of a mildly obese howler monkey in a dress. Of course, judging the image in its current state is somewhat unfair, as it isn't anywhere near finished. At some point, it became apparent to the amateur painter that she was way out of her league, and she contacted the local cultural heritage institution to inform them of the changes she'd made. The painting, by 19th-century artist, Elias Garcia Martinez, was worth little, even before its impromptu restoration, but it apparently held a great deal of sentimental value for locals. It was donated to the Centro de Estudios Borjanos by Martinez's granddaughter only a few weeks previously. 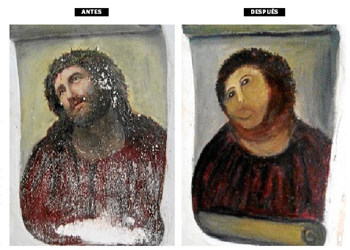 While western culture isn't exactly hurting for paintings of Jesus performing his trademark head tilt, it's always tragic when art is lost, be it to war, theft, decay or, in this case, excess helpfulness.